Youtube Monetization Update 2018-2019 | Which Channels Are Eligible For Monetization? | Technical mahaur - Technical Mahaur - Learn Something New Everyday in Hindi! Agar aap ek Youtube ke content creator (वीडियो निर्माता) hay, Youtube me video create karke Adsense se money earning (पैसा कमाई) karne chahate hay. Too aap ke liye “Youtube Monetization Update 2018” aya hay jis ko follow (पालन) karna hoga. Inn Updates (अपडेट) me bohut sari rules included (नियम शामिल) kiya hay youtube ne, hare k New/Old creator (वीडियो निर्माता) ke liye. Kuch din pahale vi kuch Videos me monetization (मुद्रीकरण) on ho jate thee. linik kuch din pehele Youtube ke Official Channel per ek “Youtube monetization rules” ke upar video publish (प्रकाशित) huya hay. usme sabhi video creators (वीडियो निर्माता) ko yea information diya gea hay kon kon videos me Monetization enable (सक्षम) / disable (अक्षम) hoga. Inn update se youtube unn public ko support kar raha hay jo ORIGINAL Creator hay & Fake channel ko bandh kar rahe hay. Too agar aap ek Original Content Creator hay to ghabrane ke koye baat nehi. Agar aap ke channel per 4000 Youtube watch time & 1000 Subscriber complete ho gaye hay. Wait kijia REVIEW ke liye. Kiu ke agar app ke channel 1st Review (समीक्षा) pe cancel ho giya hay & 2nd Review me daal diya hay Youtube nee. Agar 1st Review cancel hua to daar ne koye baat nehi, 2nd review Youtube ke official employs karte hay. 2nd Review (दूसरी समीक्षा) ke liye 1 month time lagega. Kon kon Youtube channel ke monetization (मुद्रीकरण) on honge, kis kis ke channel ke monetization kavi vi on nehi honge. 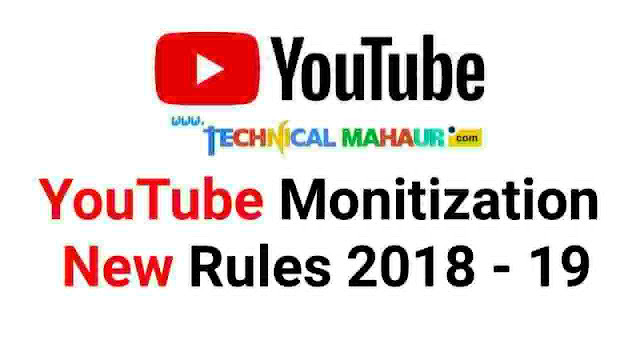 Agar aap ke channel per 4000 Youtube watch time & 1000 Subscriber complete ho gaye hay, taab vi yea “Youtube Monetization Update 2018” rules apke upar effective (प्रभावीत) hoga. Agar aap yea sab Topics (विषय) ke uper kam kar rahe hay to please usko bandh kar dijia. 1. Agar aap PHOTO SLIDE SHOW bala video banate hay to, aap ke channel kavi vi monetized (मुद्रीकृत) nehi hoga. Isme hum bohut sari Free & copyright pictures use karte hay, Youtube ke liye yea creative idea (रचनात्मक विचार) nehi hay. Pehele too Inn sab videos me monetization (मुद्रीकरण) on ho jate thee, likin abhi nse ehi hoga reject (अस्वीकार) ho jayega. 2. Agar aap ke Video me Auto generated Voice (Machine voice), jaise kuch News channel use karte hay. Abhi se aap ke videos me khud ke VOICE use (उपयोग) kijia. 3. WHATSAPP Status-reaction channel, MUCALLY Videos, TIK TOK videos ke uper koye vi ads show nehi honge. Kuke iss me hum log other platforms (मंच) ke videos ko collect (इकट्ठा) karke youtube me upload kar rahe thee. Pehele too Youtube inn sab videos ko funny (मजेदार) categories me rahk ke monetization on kar dete thee, kuke inn sab videos me jada views atee thee. Likin recent policy (नीति) ke mutabik inn sab Videos/Channel reject (अस्वीकार) list pe hay. 4. KIDS channel per, yeane bachho ke videos ke uper monetization on nehi honge. 5. Duplicate (प्रतिलिपि) content use karna Youtube & Google Adsense ke terms and conditions (नियम और शर्तें) ke khilap hay. Agar aap kisi ke videos kp chory karke apne channel per upload (प्रकाशित) kar rahe hay to, aap ke video ke sth sath channel vi suspend (निलंबित) ho jayega. Which Channels Are Eligible For Monetization? Youtube Strictly announced (कड़ाई से घोषणा की) kiya hay, Kon kon Youtube channel ke monetization on ho jaye ga 1st or 2nd Review ke baad. Agar aap ke videos pe achha content hay too aur aap ke channel Under Review (समीक्षाधीन) hay to daar ne ke koye baat hi nehi youtube review karke uss ke monetization on kar dega. 1. Movie Reaction channels per monetization on ho jayega. 2. Roasting Channels & Comedy Channels per monetization on honge. Kiuke inn videos ke liya acting (अभिनय) karna perta hay, Setup banana parte hay. Youtube ke liye yea sab creative (रचनात्मक) hay.